I suppose it could have been my fault 50 years ago. We had cats from time to time Growin’ up in Maine in the 1950’s, and after one extremely brutal night of sub-zero weather, I went out to find our dead cat in the dooryard. The poor critter was laying flat to the ground and frozen stiff dead as dead can be. With 7 brothers and sisters, I felt sad but not really guilty. Afterall, we didn’t rotate turns letting in the cat. How then, do you suppose, years later this story is so difficult to tell? Being I moved away from Maine as an adult and have told the tale of the frozen dead cat in the dooryard on several occasions, just about every time the listener interrupts. They don’t chime in with normal questions about the cat or the circumstances. The real question people want answered is “What the heck is a dooryard?” If it’s something you can be “in” was he in like a wheelbarrow or something? Makes me wonder has anyone written a book “How to Talk Mainah” kinda like they did for rednecks? Turns out the word dooryard is not universal in all 50 states. Short answer? That’s the yard where you are standing when you leave the house, and depending on the door you exit it could be the back yard or front yard, too. Outside of Maine most folks probably just say “yard”. 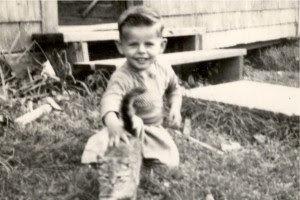 Note: Yes, that’s me in the photo petting a cat in our dooryard in Derby Maine at around age 3, so about 1952 and with what’s obviously a much much luckier cat than in this story.